She says the Republican proposal would throw millions of people off the health insurance they acquired under Obamacare. SCARBOROUGH — U.S. Sen. Susan Collins of Maine said Friday she is still firm in her opposition to Senate Republicans’ current bill to repeal and replace the Affordable Care Act, saying it would have a devastating impact on Medicaid recipients, rural hospitals and older Mainers with ACA insurance. 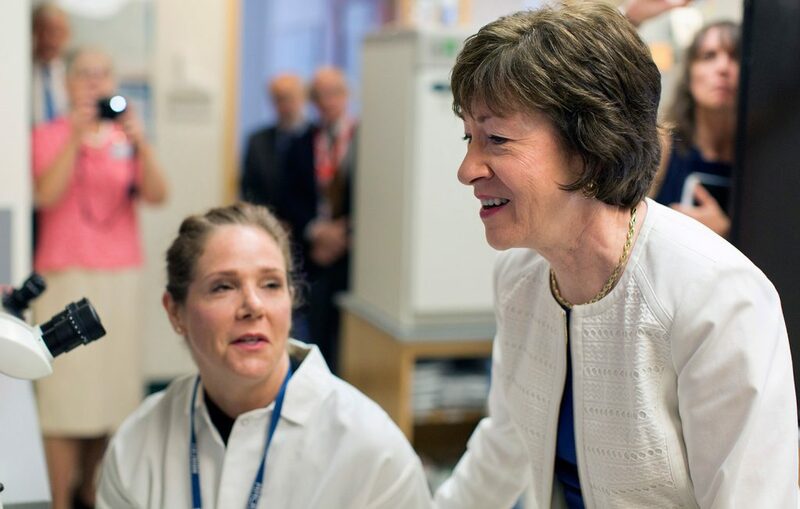 Collins, during an appearance at the Maine Medical Center Research Institute to tout a five-year, $20 million National Institutes of Health research grant, said that kicking millions of people off health insurance, as the Senate bill does, is “unacceptable.” The Congressional Budget Office has said that 22 million fewer Americans would have health insurance by 2026 if the Senate bill were to become law. Collins said a meeting in Greenville highlighted the importance of Medicaid in rural areas of Maine, because more than half of the patients are Medicaid enrollees. “What would happen to our rural hospitals if we put through those kind of sweeping reductions in the Medicaid program?” Collins said. The Senate bill was crafted behind closed doors by Republican leadership, but Collins and other moderate and some conservative Republicans have criticized the bill, with several saying they won’t support it. The bill appears to be nearly dead, but Majority Leader Mitch McConnell has vowed to hold a vote next week nevertheless. That vote would be either on the Senate bill or a straight repeal of the ACA without an immediate replacement, which some senators have advocated as an alternative approach. But Collins and two fellow Republican senators, Lisa Murkowski of Alaska and Shelly Moore Capito of West Virginia, have already said they would vote no on a straight repeal, which would effectively kill that effort. Republicans hold a slim 52-48 majority and can only afford to lose two votes. Sen. John McCain, an Arizona Republican, was recently diagnosed with brain cancer and has been absent from the Senate. No Democrats or independents are expected to support the effort. “I cannot support and did not support in 2015, the last time it was voted on, a bill that says, ‘Let’s just repeal the Affordable Care Act and maybe over the next two years we’ll figure out how to replace it,’ ” Collins said. About 265,000 Mainers have Medicaid coverage, and 80,000 have ACA insurance. Collins said that instead, Congress should turn to bipartisan reforms, and she advocated for open hearings that would bring in the voices of experts from many facets of the health care system. In January, Collins partnered with Sen. Bill Cassidy, R-La., on a more moderate plan that would have permitted states to maintain the ACA as is. If that bill is not taken up by Congress, Collins said perhaps some elements of it could be incorporated into bipartisan fixes to the ACA. In a separate interview with the Portland Press Herald, Collins suggested that one element of the bill, auto-enrollment into a basic health plan, could be part of the ACA and could be a way to reduce the numbers of uninsured. 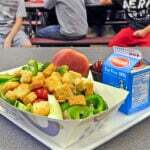 “I would like to see auto-enrollments with opportunities to opt out,” Collins said. Collins said fixing the “fiscal cliffs” in the ACA would also be an improvement. Under the ACA, enrollees are no longer eligible for subsidies if they earn more than 400 percent of the federal poverty level. Those that earn even a dollar more than 400 percent of the federal poverty level – about $50,000 for a single person – experience massive increases in premiums. Collins, in the Press Herald interview, described the health care debate in Washington as “intense,” with reporters chasing her and camping out in unexpected places. One time, she felt nearly pinned against a wall after being surrounded by reporters. Another time, she thought she would go a different way to her office and try to avoid reporters by stepping outside. “There was a whole row of cameras waiting for me. I don’t know how they knew where I was going to be and to wait outside,” Collins said. She said she has been under pressure by the party and conservative radio talk show hosts, but the response by the public since she announced her opposition has been positive. “In general, I have found that the people in Maine are either understanding or either agree wholeheartedly,” Collins said. During her tour Friday, Collins visited the lab of Dr. Leif Oxburgh, who is working on growing kidney tissue in a laboratory. Eventually, people’s own cells could be used to grow kidneys in a lab that would be used to replace diseased kidneys. About 80,000 people nationwide are on kidney donation waiting lists. Oxburgh said a lab-grown kidney is still potentially many years away from happening, if it does occur. But Oxburgh said there have been promising advances, including recently inserting lab-grown human kidney tissue into a mouse. The human kidney tissue did not die after being inserted, Oxburgh said. Collins said a $2 billion increase in NIH funding approved by Congress this year helped the institute land the grant that would include a partnership between Maine Med, the University of Southern Maine and the University of Vermont. She said Congress needs to protect the NIH from cutbacks proposed by the Trump administration. She said research that is happening in Maine and elsewhere funded by the NIH will help find treatments and cures for many chronic conditions and diseases.